About the date of the first Armistice Day, Robert Schaffner, then Vice-President of the firm, was quoted extensively in the Chicago Tribune. He noted that banking reserves were kept high during the war due to its uncertainties. He pointed out that foreign-born citizens, fearing a confiscation of bank accounts, had been hoarding and hiding their resources. He was optimistic that industrial and monetary conditions would soon become expansive. This optimism was apparently shared by his Uncle Abraham who, about this time, decided to expand and extend what was then primarily a commercial paper business into a general securities business. He utilized the extensive corporate connections of the firm to originate longer-term securities offerings, particularly fixed income securities, with short to intermediate term maturities. Such securities were especially purchased by institutional investors, particularly banks, with which institutions Becker had established a widespread and very favorable national reputation. The missing ingredient in Mr. Becker’s plan was the absence of a sales force dealing in capital securities, especially bonds rather than short-term promissory notes. Thus, in the decade between 1916 and 1925, a core group of highly capable men, mostly just out of college, were hired, trained and put to work as securities salesmen. This group and years of hire included Howell Murray (1916); William L. Jacoby (1918); Herb Schaffner (1918); Bill Eaton, Walter McEvoy, Harry McCosh, Vladamar (June) Johnston, and Andrew Baird (1919); Francis Patton (1920); Henry Getz and William Mabie (1921); Joe Levin (1922); Charlie Ritter (1925); and Irving Sherman (1926). Also, about this time, Lester Roth (1924), was brought in to provide fresh leadership to the firm’s back office operations, accounting, and treasury activities. This was the start of a long history within Becker of top management priority being given to achieving excellent "back office" support of the marketing and services ends of the business. (See Appendix 8). Of the above fresh, young talent joining the firm, readers of the Chicago Tribune sports page would have recognized the name "Harry McCosh." Harry was captain of the University of Chicago track team in its 1918-19 indoors and outdoors season. In the team's final track meet in June 1919, the headline of the Tribune sports page read "Great Finish by McCosh," memorializing Harry's half-mile (and final) leg in the Penn Relay's Distance Medley. He outlasted a Princeton competitor in the last twenty yards of the race. McCosh at age 19 was regularly under 4:30 in the mile and under 2:00 in the half-mile, both excellent times around 1920. In 1919, William Irwin, the leading community banker in Columbus, Indiana, financed Clessie Cummins, a self-educated mechanic/inventor who grew up on a farm near Columbus. Clessie developed a low-horsepower diesel engine and formed the Cummins Engine Company. Although not substantiated, the story within Becker (when the author joined the firm in 1958) was that David Stern, then Becker chairman, had participated in the original funding of Cummins, and that this action had led to the long-term investment banking relationship between A.G. Becker & Co. and the Cummins Engine Company, on which board David Stern served for many years (1). In 1921, it must have been a great pleasure for Abraham Becker to welcome back to Chicago, and into the firm, his only son, James. Shortly, after graduating from Cornell, young Becker went to Europe to assist Jewish charitable organizations following and alleviating the misery resulting from the pogroms taking place in Eastern Europe. In due course, Jim became Director-General of the Joint Distribution Committee in Eastern Europe, working under the direction of Herbert Hoover. Correspondence in the archives highlights how proud Mr. Becker was of his son. A.G. must have been happy, too, to have son James join the firm during its first major expansion period. Starting in 1919 the firm became very active in originating corporate financings. Between that year and 1925, the firm was the sole or co-manager of a wide range of preferred stock and intermediate term note financings including such issuers as Pressed Steel Car; Speigel May Stern; Interstate Iron & Steel; Cuyamel Fruit; Rainey Wood Coke; Avery Company; Boston Stores of Chicago; Brunswick, Balke, Collendar; Penick & Ford; Yellow Manufacturing Acceptance; Yellow Taxi; Hupp Motor Car Co.; Alfred Decker & Cohn; Fred Rueping Leather; Goodyear Tire & Rubber; Central Coal & Coke; By-Products Coke; Hammermill Paper; McPhee & McGinnity; Kleinert Rubber; Edgewater Beach Hotel; Real Silk Hosiery; Albert Pick; New Mexico Lumber; and Phillipsborn. In a brief outline of the firm's history that appeared in a 1921 internal newsletter (undoubtedly written if not approved by Mr. Becker), it was noted that up to December 1919, the firm was known as a "Commercial Paper House," and that it wasn't until December 1919 that an "active Bond Department" was established and "investment issues" were originated, distributed, and traded. The firm had also become quite active in the municipal bond market, leading or co-leading issues for the cities of Akron, Columbus, Jersey City, Elgin (IL), and Calgary. Average short-term money rates remained generally below 5% for the decade 1907-1917, but spiked in 1918, and for many Becker issuers, hit 8% in August 1920. In October 1920, Sears Roebuck & Co. offered $50 million of one-, two-, and three-year Serial Gold Notes respectively to yield 7.85%, 7.70% and 7.60%. This offering was proposed by Mr. Becker to his close friend, Julius Rosenwald, builder and CEO of Sears Roebuck, as a way to fund a heavy amount of the maturing bank loans and open market notes. A representative of Goldman Sachs was on the Sears board at the time, but the funding program was originated by Mr. Becker, and reportedly the Becker firm placed the primary portion of the issue. Becker’s role in this issue was considered “sensational.” The deal put the firm “on the map” in terms of nationally recognized distributing power - especially of short- and intermediate-term notes. At the same time that Mr. Becker was leading the firm’s expansion into a general securities business, he continued on a personal basis to be an investor in local business opportunities, especially start-up banks. In 1918, he was reported to be a personal investor in some 22 Chicago area banks. In 1920, Mr. and Mrs. Becker built a home in Highland Park, at 405 Sheridan Road, designed by Howard Van Doren Shaw with landscaping by Jens Jenson. The home was luxurious, with thirty rooms, three fireplaces, six bedrooms, seven full and two half baths, a four-car garage, separate coach house, and other amenities on large acreage. It is also good to know that A.G. Becker was not all business - that he knew how to relax and enjoy the fruits of his labors. He was a member of a fishing club in Wisconsin and thoroughly enjoyed his visits there. He was also a golfing member of the Lake Shore Country Club where in August 1921, he won the “veteran’s tournament” with a gross score of 92. Another one of A.G. Becker’s closest friends, especially in his days of living in his new residence, was Albert Lasker. Lasker had come to Chicago in 1898 from Galveston, TX, at age 18, to start as an office boy in Lord & Thomas, a Chicago-based advertising agency. In 1912, at age 32, he purchased the agency. Lasker soon became the father of modern advertising. He built Lord & Thomas into one of the leading advertising agencies in the world and became quite wealthy. At one time (per Wikipedia) he was the second largest stockholder in the Pepsodent company, and an early owner of the Chicago Cubs. It was reported that he often played golf with Mr. Becker at Lake Shore until he built his own golf course on his estate in west Lake Forest. It is not clear whether Mr. Becker was able to play golf on that course before he died in 1925. Becker’s friendship with Lasker would again come into play in 1944, as later reported. In April 1921, every employee of the firm received a brochure which (per the statement on the cover) was “the start of a proposed monthly publication - to which you are invited to suggest a name.” We know that the name, shortly adopted, was “Links,” of which the Newberry Library archives have more than one sample. 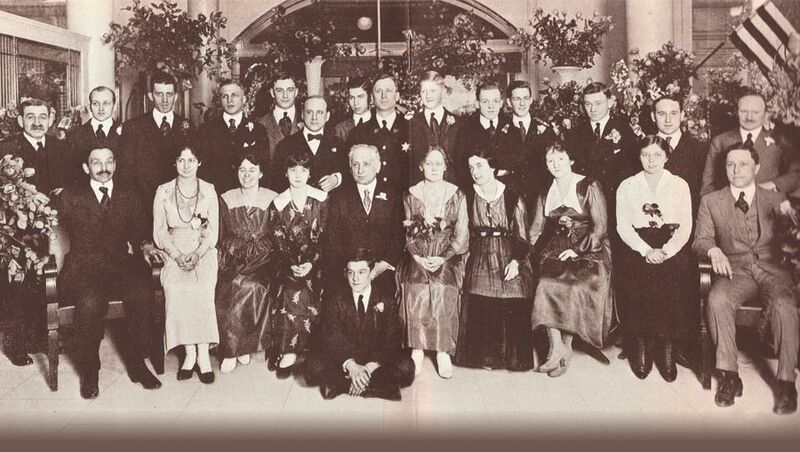 The centerpiece in the first publication was a photograph of twenty-four people taken in 1917. Mr. Becker is in the front row center, David Stern to the far right, and Bob Schaffner to the far left. The brochure goes on to report that in 1921 (the date of the brochure), the employment in Chicago was now 100, and in the other offices, 41, as follows: New York (21); St. Louis (8); Seattle (4); Los Angeles (2) and San Francisco (6). 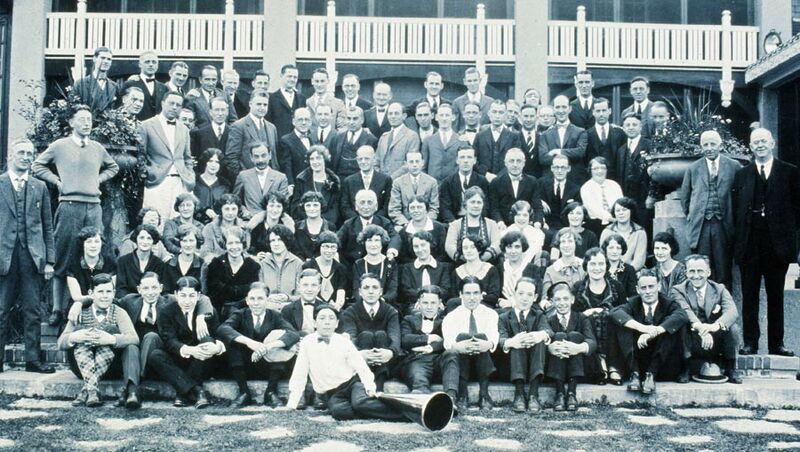 During this same period of the early 1920s, Mr. Becker began to host an annual summer outing at the Lake Shore Country Club for all the employees of the Chicago office. These gatherings were recorded in a number of group photographs and printed text. 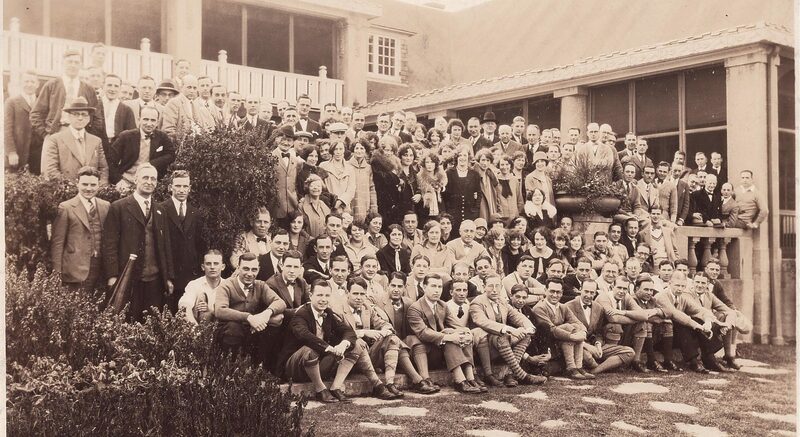 One of these photographs shows A.G. Becker himself seated in the center of the group, and from another view. In 1923, Mr. Becker, billed as the “Dean and Pioneer” of the commercial paper business, was scheduled to give a speech on that subject before the local bankers’ association. Due to temporary illness, Mr. Becker could not appear and thus the speech was read by his younger colleague, Robert Schaffner. The presentation captures the flavor and practices of the early years of the commercial paper business. Looking at the flow of underwritings handled by Becker as a managing or participating underwriter, from about 1912 well into the 1920s, the firm clearly had built distribution prowess in intermediate notes and preferred stocks. Banks, especially smaller outlying units, on which foundation Becker had built its commercial paper business, were the primary customers. It was said that one out of every five banks in the U.S. were on Becker’s books. January 1924 marked the first issue through securities dealers of the Short Term Notes of the Federal Intermediate Credit Banks. The syndicate consisted of Goldman, Lehman, Salomon, Moseley, and Becker, some of the nation’s leading dealers in such securities. Shortly after this first issue, Becker prepared a booklet describing the Banks, their operations, and their creditworthiness. This five-firm syndicate handled a number of similar offerings of the FIC Banks over coming years. On March 31, 1925, the A.G. Becker & Co. advertisement in the Chicago Tribune was noteworthy and likely had the personal input of Mr. Becker. A few weeks later, in early April, a sequential message - in a bold three-lined frame - appeared in the Tribune, and again emphasized the "sound thinking" of A.G. Becker - both the firm and the man. (1) The Cummins story becomes even more interesting and personal, as follows. The author completed his MBA at the Harvard Business School (HBS) in June 1957 and stayed on for a year as the research assistant and case writer for Prof. Charles Williams. In early 1958, the author was considering permanent employment to start in the fall. Having written some cases featuring investment banking situations collected from Wall Street firms, the author was inspired to find a job in the securities industry, but for various reasons, didn't wish to work on Wall Street. Thus, work in the financial department of a Midwest industrial corporation, or possibly a commercial bank, became his goal. There were openings in the Finance Department of Cummins Engine and the author arranged an employment interview in the Columbus, IN, headquarters of the company. Flying out from Boston to Indianapolis, the author was doing homework on Cummins, relying primarily on a prospectus covering a recent public offering by Cummins managed by the firm of A.G. Becker & Co., headquartered, much to the author’s surprise, in Chicago. After the Cummins interview, the author was scheduled to proceed to Chicago for other interviews. Given those plans, the author phoned the HBS alumni office to inquire whether there were any HBS graduates at this Becker firm in Chicago, about which firm the author had no knowledge. The answer was “yes”-- Becker employed a number of HBS graduates, including a Roger Brown and a John Colman in the Chicago office. Making a long story short, the author called and made an appointment to visit these Becker men in Chicago. After these interviews, as he walked out of Becker’s office at 120 South LaSalle, he felt that he had stumbled on to his future employer. In a few months, and after another visit to Chicago, employment was agreed upon, and lasted some twenty-three years. For that, the author thanks, among others, David Stern, William Irwin, and Clessie Cummins.